Consolidate knowledge of key NMBA Registered Nurse Standards for Practice, National Safety and Quality Health Service Standards, and National Health Priorities to enable effective decision making, planning and action in a range of complex clinical situations across the lifespan. Apply knowledge of anatomy, physiology and pathophysiology to support evidence-based decisions for planning and action. Review your chosen case scenario with the lecture and tutorial material associated with the deteriorating patient. Hypovolaemia Maureen Hardy is a 77 year old women who has been sent in by her GP for review who has had two episodes of haematemesis at home. Four hours after arriving on your ward she vomits blood and has blood around her mouth, you also note that she appears pale, sweaty and drowsy. Maureen is responding only to verbal stimuli. Assignment Hints The assignment is asking what you findings would be if you were to undertake a physical examination of your chosen case study and report back using ABCD. Remember the patient profile might not cover all aspects of ABCD. For example if your patient was short of breath you would explain how, what and why they were short of breath. The What: what did your physical examination find? The How: how did it manifest itself? The Why: why did this occur? You succinctly and accurately described essential information in each element of the ISBAR framework. You clearly and accurately described mostly essential information in each element of the ISBAR framework. You soundly and accurately described essential information in each element of the ISBAR framework. You adequately and sometimes accurately described essential information in each element of the ISBAR framework. You have not adequately and accurately described essential information in each element of the ISBAR framework. Your handover flowed logically and contained only essential information that related to the health problems identified from the comprehensive physical assessment of the case study. Your handover was logical in most parts and contained mostly essential information that related to the health problems identified from the comprehensive physical assessment of the case study. Your handover was sound and somewhat logical with some essential information that related to the health problems identified from the comprehensive physical assessment of the case study. Your handover was adequate and somewhat logical that related to the health problems identified from the comprehensive physical assessment of the case study. Your handover was inadequate and not logical. You have missed crucial sections of essential information that related to the health problems identified from the comprehensive physical assessment of the case study. Your handover was wholly inappropriate inadequate and not logical. You have missed large sections of essential information that related to the health problems identified from the comprehensive physical assessment of the case study. Used correct terminology and professional language consistently with the case study. Used correct terminology and professional language for most of the handover the case study. Used correct terminology and professional language for some of the handover the case study. Used correct terminology and professional language for part of the handover the case study. You have not used correct terminology and professional language for the majority of the handover the case study. Correct terminology and professional language used infrequently the case study. Kept to word limit. Kept to word limit. Word limit under/over the 10% allowance. Not within required word limit. Anaphylaxis is one of the most common conditions nurses come across in the course of their work. Although it has not had a universally accepted definition, a number of researchers and scholars have made numerous attempts to describe the condition. According to Johanson as cited by Allen (2016), anaphylaxis is a severe, life-threatening, generalized or systematic hypersensitivity reaction (Estelle & Simons, 2009). There are various types of anaphylaxis depending upon the cause of the condition. According to Mali & Jambure (2012), some of the most common types include drug-induced anaphylaxis, anesthesia-related anaphylaxis, latex-induced anaphylaxis among others. 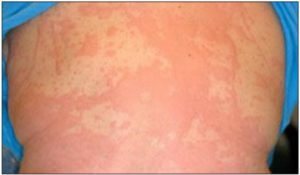 In the discussion that follows, we analyze a case of drug-induced anaphylaxis through the assessment of Jim Palmer, a 53 year old patient as presented in the anaphylaxis case study. The structured ABCDE approach has proved to be significantly successful and appropriate in not only the training of the necessary skills in life support courses, but is also an imperative kit in the understanding of a patient’s condition (Thim et al. 2012). The ABCDE approach assesses the patient with regard to the nature of the airways, the breathing patterns, circulation of air, disabilities and disorders resulting from the condition and the full exposure of the patient. According to Thim et al. (2012), this should be the initial assessment approach for patients demonstrating anaphylaxis conditions. Having received approval in most emergency cases, the ABCDE approach to achieve five main aims and objectives. It seeks to provide a life-saving treatment, break down complex medical conditions, serves as an assessment and treatment algorithm, establishes common situational awareness among all the different treatment providers and buys time to establish the final diagnosis and treatment for the patient (Thim et al., 2012). Thim et al. (2010) argues that the approach can effectively be applied in the streets without any equipment, or in advanced forms such as in the emergency departments, general wards in hospitals or even in the intensive care units. In the discussion that follows, we assess Mr. Palmer through the application of the ABCDE assessment tool as described above. The first element of the ABCDE seeks to assess whether or not the patient’s airway is patent. With a complete obstruction of the patient’s airways, there is no respiration despite any efforts applied by the medics. As a result, the patency of the patient is the first assessment in the ABCDE assessment approach. A critical assessment of the patient demonstrates a number of signs for partial obstruction of the airways. As described in the case, the patient is breathless upon view by the nurse. The patient also has bilateral chest movements and demonstrates a shallow depth of breathing. The patient demonstrates audible wheeze on breathing and has some central cyanosis. The signs and symptoms observed from the patient are similar to the signs and symptoms of anaphylaxis resulting from penicillin (Simons et al., 2011). According to Thim et al. (2012), the main signs that should lead to the medics ruling for airway obstruction include changed voice, noisy breathing and increased breathing effort. Bhattacharya (2010) also notes that one of the notable signs of anaphylaxis from penicillin drugs results in an immediate decline in blood pressure and the volume of blood. These signs and symptoms as observed in the patient demonstrate a case of airway obstruction. 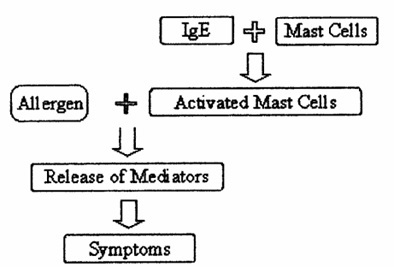 According to Bhattacharya (2010), anaphylaxis occurs when mast cells are exposed to the antigen-specific IgE and a systematic exposure to the antigens occur, thereby cross-linking the IgE (Bonadonna et al., 2009). The result is a significantly high simultaneous degranulation of a large proportion of the mast cells. 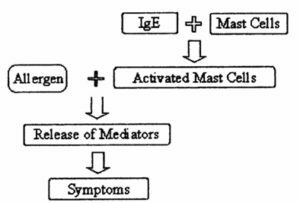 Since the mast cells comprises of histamine as well as other vaso-active mediators, the sudden release of these mediators results in the conditions as observed in the case of Jim Palmer. According to Bryson, Frost, Rosenblatt (2007), the figure below shows the chain of reactions that result in the signs and symptoms as observed in anaphylaxis. The second consideration is any form of life threatening breathing conditions. The objective as explained by Thim et al. (2012) is to assess whether breathing is sufficient to sustain life of the patient. The main aspects of focus in breathing assessment include the rate of respiration, movement of the thoracic walls, occurrence of cyanosis, distended neck veins and the lateralization of the neck veins. A closer look at the conditions of Mr. Palmer indicates insufficient breathing conditions. According to the case study, the respiration rate of the patient is as high as 26bpm with a capillary refill rate of above 4 seconds. In addition to these, the patient demonstrates bilateral chest movements and some central cyanosis. Moreover, the oxygen saturation rate of the patient was observed to be 91%, a rate that is below that of a normal individual. According to the patient, he experiences a tight feeling of the throat, which demonstrates the availability of distended neck veins (Thim et al., 2012). These signs and symptoms are sufficient to conclude that Mr. Palmer experiences insufficient breathing. The objective is to assess whether the patient’s blood circulation is sufficient. The patients capillary refill rate and pulse rate are the main indications of problems in blood circulation (Thim et al., 2012). According to the case study, the patient’s capillary refill rate is far below that of the normal person which is usually less than 2 seconds. In addition, the patient’s blood pressure was observed to be 90mmHg, which is less than the blood pressure of a normal adult which is 120/80 mmHg which suggests arterial vasoconstriction. The other primary indication of problems in blood circulation is the color of the patient’s skin. As observed in the image shown below, the patient is pink in the back. The patient also expresses reduced consciousness which is one of the signs of reduced perfusion (Thim et al., 2012). These signs and symptoms are enough evidence that the patient under consideration suffers from blood circulation problems. This assesses the level of consciousness of the patient. According to Thim et al. (2012), the patient should be graded as alert (A), voice responsive (V), pain responsive (P) or unresponsive. According to the case study, Mr. Palmer’s level of consciousness decreases with time and is only responsive to voice. As such, the patient’s appropriate grading is V.
Finally, the ABCDE seeks to search for any clues towards explaining the condition. The primary observable clue of the condition is the condition of the skin. According to the case study, the patient has rushes and appears flushed. The patient is also lightheaded and dizzy. The above analysis shows many signs and indications that the patient suffers from allergy. These signs and symptoms, together with the above explained signs indicate a possible anaphylaxis resulting from penicillin drugs (Thim et al., 2012). With the consideration that the only drug that the patient has been administered to is Flucloxacillin, which is one of the penicillin drugs, it can thus be concluded that the patient suffers from anaphylaxis from Flucloxacillin overdose. Situation Diagnosis/ Reason for admission The patient was admitted with a severe cellulitis to his left leg. Presenting concern He was administered with a Flucloxacillin overdose and is presenting anaphylaxis condition. Background Background information · The 53 years old patient was admitted to the hospital today following a severe cellulitis on the left leg. · The patient was initially administered with one dose of Flucloxacillin before he was given another dosage of the same drug. · He is a farmer and works from his farm. · The condition of anaphylaxis emanated from the treatment given in the morning. Assessment Key Issues / Goals · An ABCDE assessment of the patient demonstrates obstruction of the airways, difficulties in breathing, problems in blood circulation. · The patient is flushed, and has his consciousness reducing with time. · His is voice responsive only. · These signs and symptoms points to anaphylaxis from a Flucloxacillin overdose. Actions Taken · Avoid any further administration of Flucloxacillin. · Head tilt and chin lift to open the airways (Koster et al., 2010). · Provide adrenaline 0.01 mg/kg into the lateral thigh to a maximum 0.5 mg. This may be repeated 5 – 15 minutes (Brown, 2009). · Provide high flow oxygen to promote continued respiration (Lieberman et al., 2010). Further Actions required · Ensure continued provision of oxygen until the patient can breathe on his own. · Continue administration of adrenaline as prescribed earlier. · Desensitization may be performed in order to convert the patient to a state in which he can tolerate the penicillin drugs as may be required during the treatment of cellulitis (Karabus & Motala, 2009). Allen, D. (2016). Anaphylaxis: a study of the condition and treatment. Links to Health and Social Care, 1(1), pp. 44 – 58. Bhattacharya, S. (2010). The facts about penicillin allergy: a review. Journal of Advanced Pharmaceutical Technology & Research, 1(1), 11-17. Bonadonna, P., Perbellini, O., Passalacqua, G., Caruso, B., Colarossi, S., Dal Fior, D., et al. (2009). Clonal mast cell disorders in patients with systemic reactions to Hymenoptera stings and increased serum tryptase levels. J Allergy Clin Immunol. 123(1), 680–686. Brown, F. (2009). Current management of anaphylaxis. Emergencias. 21(1), 213–223. Bryson, E., Frost, E. & Rosenblatt, M. (2007). Management of the patient reporting an allergy to penicillin. Middle East Journal of Anesthesiology, 19(3), 496 – 500. Craft, J., Gordon, C., Huether, S., McCance, K. & Brashers, V. (2016). Understanding pathophysiology – ANZ adaptation (2nd Ed.). Elsevier: Elsevier Health Sciences. Estelle, F. & Simons, R. (2009). Anaphylaxis: Recent advances in assessment and treatment. J Allergy Clin Immunol. 124(1), 625–636. Estes, M. & Schaefer, K. (2016). Health assessment and physical examination (2nd Ed). New York: Delmar/Thomson Learning. Karabus, S. & Motala, C. (2009). Penicillin Allergy in Children. Current Allergy & Clinical Immunology, 22(2), 64-66. Koster, R., Baubin, M., Bossaert, L., Caballero, A., Cassan, P., Castren, M., Granja, C., Handley, A., Monsieurs, K., Perkins, G., Raffay, V. & Sandroni, C. (2010). European Resuscitation Council Guidelines for Resuscitation 2010 Section 2. Adult basic life support and use of automated external defibrillators. Resuscitation, 81(10), 1277 – 1292. Lieberman, P., Nicklas, A., Oppenheimer, J., Kemp, F., Lang, M., Bernstein, I., Bernstein, A., Burks, W., Feldweg, M., Fink, N., Greenberger, A., Golden, B., James, M., Kemp, F., Ledford, K., Lieberman, P., Sheffer, L., Bernstein, I., Blessing-Moore, J., Cox, L., Khan, A., Lang, D., Nicklas, A., Oppenheimer, J., Portnoy, M., Randolph, C., Schuller, E., Spector, L., Tilles, S., Wallace, J. (2010). The diagnosis and management of anaphylaxis practice parameter: 2010 update. Allergy Clin Immunol, 126(3), 477-480. Mali, S. & Jambure, R. (2012). Anaphyllaxis management: Current concepts. Anesthesia Essays and Researches, 6(2), 115-123. Mueller, R. (2007). Cardiovascular disease and anaphylaxis. Curr Opin Allergy Clin Immunol., 7(1), 337–341. Simons, R., Estelle, F., Ardusso, F., Beatrice, M., El-Gamal, M., Ledford, K., et al. (2011). World Allergy Organization Guidelines for the Assessment and Management of Anaphylaxis. WAO J. 4(1), 13–37. Thim, T., Krarup, H., Grove, L., Lofgren, B. (2010). ABCDE – a systematic approach to critically ill patients. Ugeskr Laeger, 172(47), 3264–3266.